2009 proved to be a challenging year for the Britannia Aircraft Preservation Trust. 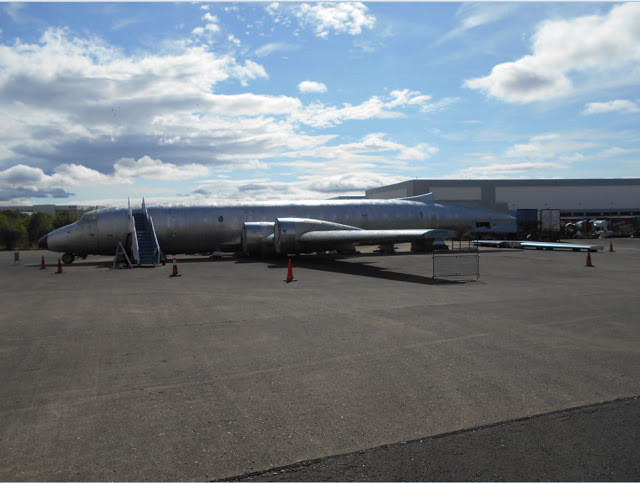 Early in the New Year the working relationship with the Jetstream Club and the rebuild of Britannia Charlie Fox at Speke came to an end. There were a number of reasons for this, but the arrangement simply was not working for either party so the ''parting of the waves'' was the only way forward. We would like to put on record our thanks to the members of the Jetstream Club who worked on the project with such enthusiasm and hard work since the aircraft arrived at Speke nearly three years ago. Without their support Charlie Fox would we are sure have ended its days on the scrap heap at Kemble. We are eternally grateful. An agreement was then made with Kewgreen Hotels who own the site at Speke and the Crowne Plaza Hotel who run the hotel in the former terminal building at Speke, for Charlie Fox to remain on its present site outside the hotel. We are grateful to both Companies for their continued support of the project. In early Spring we came to an arrangement for the Newcastle Aviation College to provide final year aircraft engineering students to work on Charlie Fox on a regular basis. This involved up to eight students and their tutor Brian Dixon, driving from Newcastle to Speke, working on the aircraft, staying overnight, working on the aircraft the next day before driving back to Newcastle. The standard of work provided by the students was excellent and a special thanks goes to Brian Dixon for making it all possible, The students mainly worked on the rear fuselage join and strap which involved fitting hundred of rivets. Not an easy task in sometimes appalling weather conditions. In July, Charlie Fox was open to visitors during the annual Air Fair organised by the Jetstream Club. This proved very popular and it is our intention to open the aircraft on a regular basis once the aircraft is standing on its undercarriage. Work on Charlie Fox has been slow over the past year and on the face of it, it looks as though very little progress has been made. However the front and rear join and strap are nearing completion, ready for the aircraft to be lifted onto its undercarriage during 2010, the front nose gear has been extended from its undercarriage bay where it has resided for the last 22 years and the rear crew area has been cleared, cleaned and etched ready for the installation of crew bunks, toilet and galley during 2010. Our other aircraft G-ALRX which is on loan to the Bristol Aero Collection at Kemble has been under going some restoration work under the expert guidance of Bill Meehan and Mike Jones. During 2009 the rear bulkhead was replaced and restoration of the small cabin interior commenced. In addition one of the cockpit windows has been removed with a view to getting a new one manufactured by a Company in London. It is hoped that the interior restoration will be completed by June 2010.